Pancho, Lefty & Sammy Arrive! I posted on their own blog - Jack and the Alpacas all about their arrival and first day in their new digs, but just had to post this one official first day photo: Couldn't make them pose like this if I had to - they chose this pose all on their own! They are from left to right - Pancho, Lefty and Sammy. You can read all about them, by clicking on Jack and the Alpacas on the right side under my other blogs! Seam Ripper! First Step to Improvement! 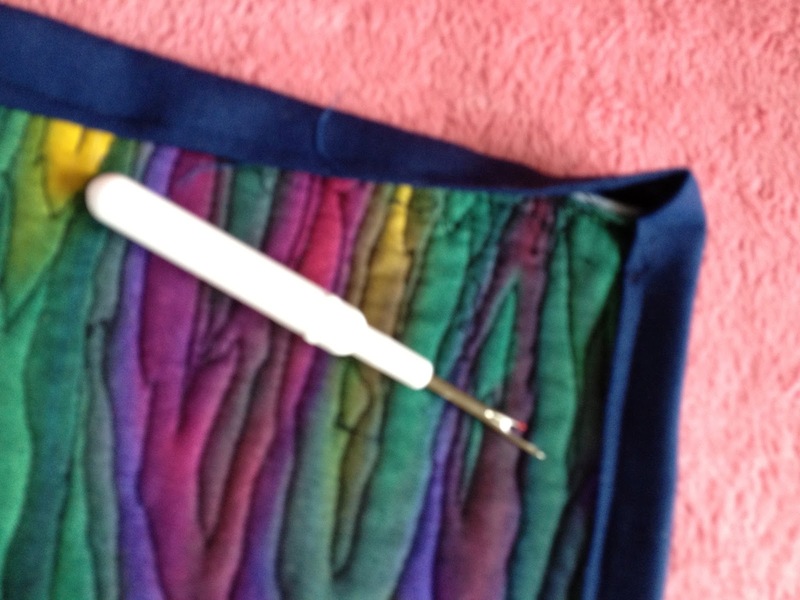 I would love to have said, "Seam Ripper, First Step to Perfection," but I know it's just improvement. 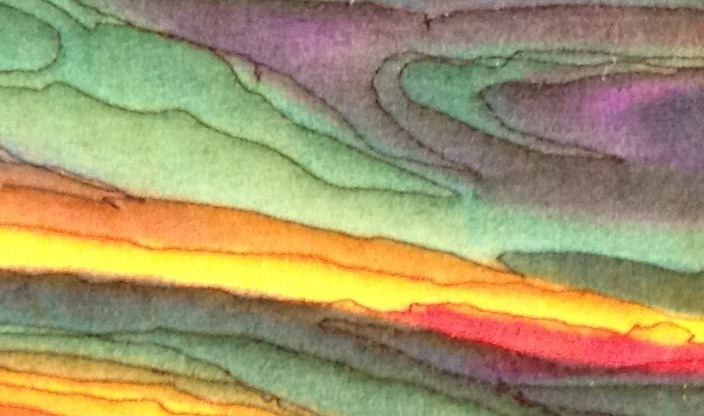 And with this in mind I have taken my little quilt hanging, "Sunset Reflection on Lake" and removed the binding! I was never happy with it, even though I called it finished and posted it on Flickr! It was not finished because it was not done correctly! 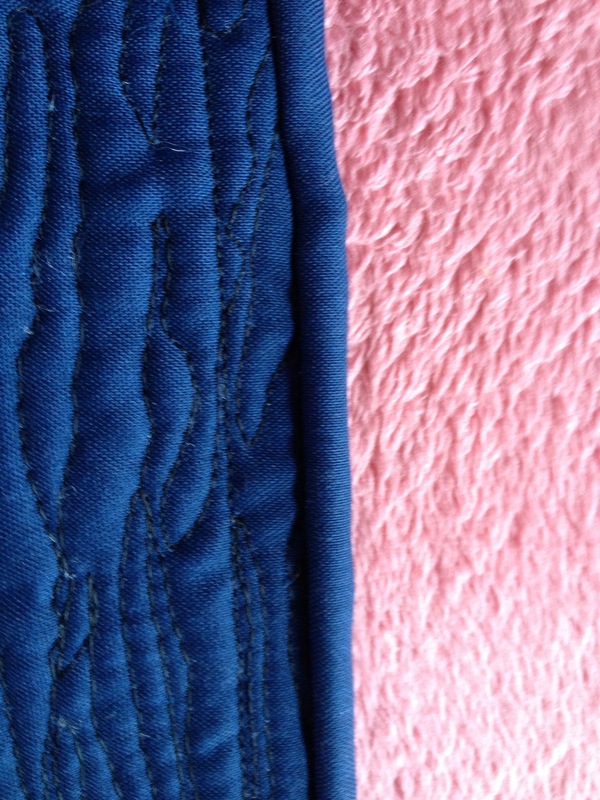 I had followed the instructions for sewing a binding on with a sewing machine, just like the first two; however, I didn't do the the first seam correctly. It was right on the edge, barely catching the fabric along the edge and then when I turned it to sew on the front, it was way too big! It covered too much of the quilt. Some of the colors along the edges were missing and I knew it. I had this huge binding on the front and almost nothing on the back and I still called it done! Well, suddenly today I couldn't stand it. I was looking at the picture of the quilt prior to binding and after and thought, "it's time I pull out the seam ripper and start this over. And I did! 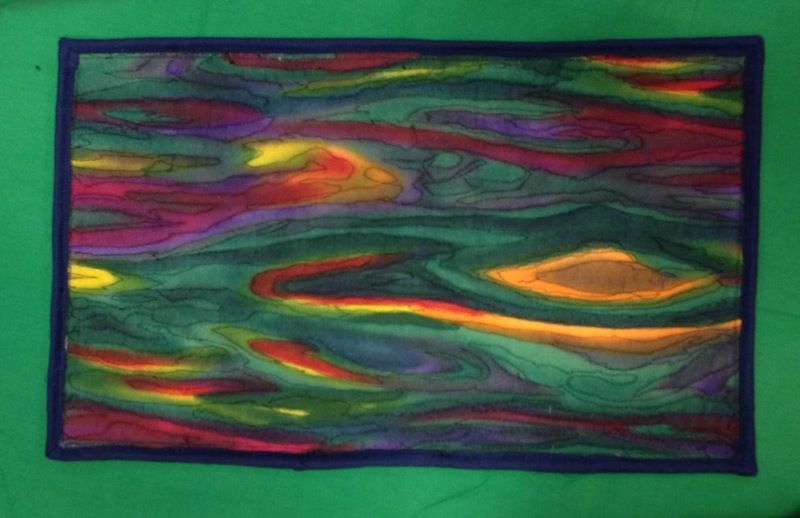 I'm may rethink the color of the binding and may change it, but even if I reuse this, it will be seamed correctly on the back, so that the binding on the front is of equal size and correct. It only took about fifteen minutes to remove this and I will forever be thankful that I did it. I would normally beat myself up for doing it wrong and then leaving it, but not today. I just see it as part of the learning process and proud of myself for being willing to fix it! 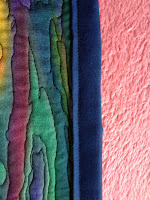 And, so I'm leaving this post for a few minutes (hopefully) and a binding on my quilt. When I come back, I will add a picture of the "new" finished quilt. Too late for the challenge, but not to late for me! Sunset Reflection on Lake - Binding redone, proper size! And here it is, all finished! I went with the same binding, just put on correctly and I'm so much happier. It's still far from perfect, but it's just my third, well, now I guess it's my fourth binding and I will get better and now, the colors show properly. 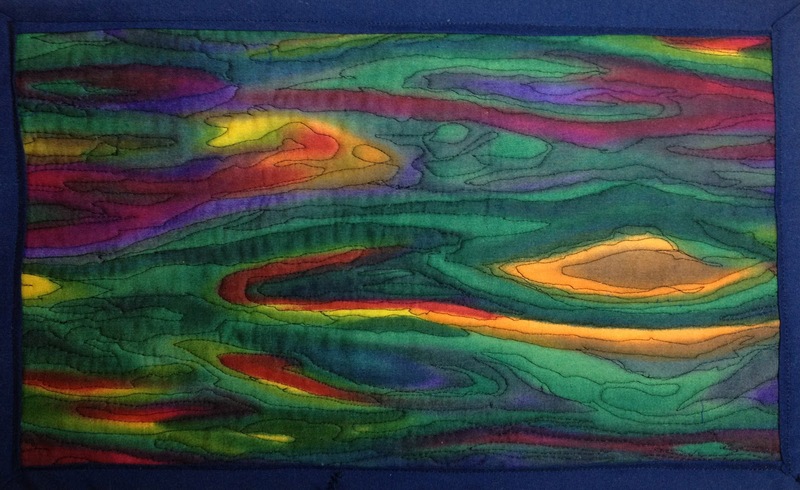 The binding was so big, that it blocked out some of the colors like down in the bottom left corner and upper right, specifically. I am satisfied! Normally I would be at church on Sunday morning, but my cough is still lingering and so I stayed home. 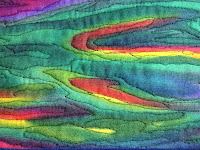 As I was sitting here at the computer going through the quilts that have been submitted to Project Quilting for this weeks challenge I was once again drawn to Annie Young's blog. As I read the descriptions and listened to how the quilters were inspired by Annie's art, I had to go dwell in her work, to listen to what she had to say through her words and her paintings. Annie posts her art along with words of her own and quotes from many famous people, including Scripture. Some of the quotes we've heard and some are new and some are ones I believe God wants us to hear again and again. She is inspired by God and His amazing love of us, as am I, but her quotes also remind me that God speaks through others. We just have to have our ears and hearts turned on and tuned in to hear Him speak. She titled her blog that day, you are are brilliant, gorgeous, talented and fabulous! My first thought was one of surprise. Immediately following was the butterfly quote and then the picture of her butterfly and a very long and beautiful quote from Nelson Mandela. I would love to show her butterfly here, but I do not have her permission, and so I have posted pictures I have taken of butterflies and their various life stages. Nelson Mandola reminds us that we are children of God and that we are designed to glorify God. I am not going to quote the entire thing here, not today, but I am going to give you the link to that specific page ofAnnie's blog and I encourage you to go and read it for yourselves. I promise you that her beautiful picture of the butterfly wings and this quote will bless you and you will know that God used Annie Young and Nelson Mandela to speak to you and to me and to everyone whose ears and minds were turned on and tuned in! You are brilliant, gorgeous, talented and fabulous! 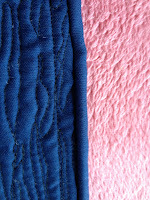 It's done and it's uploaded to Flickr and the Project Quilting Flickr Group! Yay, it's only 7:43 on Saturday evening. It's not even due until noon tomorrow! I told you in yesterday's post that Annie's art was an amazing inspiration. I hope you have already checked out her blog! So, after yesterday, there's not a lot to say. 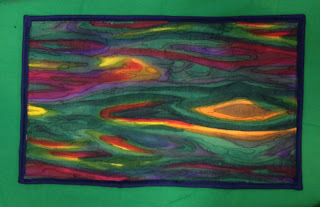 I just knew the moment I saw this fabric that it looked like the reflection of a sunset on a lake and so I cut the piece out, made the sandwich and began to do the free motion quilting. This is all so new to me and I had a blast. This was the most relaxing quilt I've done to date and I hope to do more of this type. The best part was when Bill said, I see a shark in the water and some other fish! He's being so encouraging and it makes this even more fun. 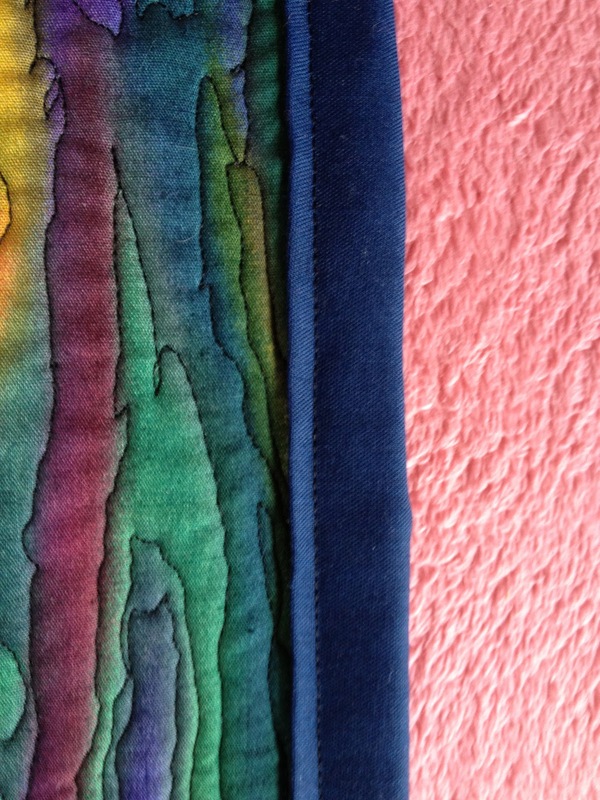 If you are seeing this post and haven't read yesterdays, be sure to back up and read all about the Project Quilting Challenge for this week and Annie Young Art. I hope you enjoy and I am off to the studio to work on some Valentines. It's next week you know and I just really want to make some fabric ones to give to some sweet friends! We'll see! I tried to do some last year and I tried last night, but then I turned to Pinterest and found some real cute ideas - so hoping tonight is successful. If I am you'll know it tomorrow! Suffering with the flu and now bronchitis, left me thinking that I wouldn’t even attempt this weeks Project Quilting challenge, but I did want to go see the inspiration on Annie Young’s blog. I had never heard of Annie Young and now, I know I’ll never forget her. I love nature, all of it, whether it’s fauna and flora, bugs, birds, sunrises or sunsets, fish or animals. I began painting as a way to use some of the many thousands of photographs I had taken! Photography was my first love. Painting is my second love and is followed by quilting so that I would have a new medium for my painting. I actually love taking pictures and I love painting, at this time I'm learning to quilt! It doesn't come as easy, but I believe I will come to love it too. Visiting Annie’s blog and looking at her work was like seeing all of my two loves in her magnificent works of art! Every piece she has done is inspiring. I saw flowers, skies, sunrises and sunsets in her art pieces and then I saw that she doesn’t see! I know she did, but she lost her sight around ten years ago and yet she creates the most amazing pieces of art. That proves that art is the window of the soul! I have always believed that what gifts I had at photography or painting were directly from God and seeing her work, I know hers are for sure and my getting to experience them is her gift to me and everyone else who sees her work. She has inspired me to let go and allow myself to be what God has created me to be! No comparisons, no excuses, no giving in to doubts and fears, but rather to let go of all the outside junk and allow God to flow through me in my art. I was reminded this week of a quote I read on the wall in a doctor’s office back in the late 70‘s, “Your life is God’s gift to you, what you do with it is your gift to God.” I saw it on Annie’s blog dated 8/18/12 or at least a very similar one and I was reminded of how much I believe that and how Annie has given an amazing gift to God! We should all strive to give Him such a gift. It seems like not feeling well really doesn’t seem very important after meeting Annie and a quilt will evolve before Sunday’s deadline. It will be the best that I can do, and I will thank God for the talent to do it and use it as an inspiration for years to come - reminding me that if we allow God to work through us, nothing is impossible, no matter the circumstance! Thank you Kim for this challenge, thank you Annie for your inspiration and your art. I have two goals - to create a piece inspired by Annie’s work and to own a piece of Annie Young art. I will meet them both! And for you, if you haven't already headed to Annie Young's blog then please do so right now! You will not be disappointed, in fact, I promise you will be inspired! 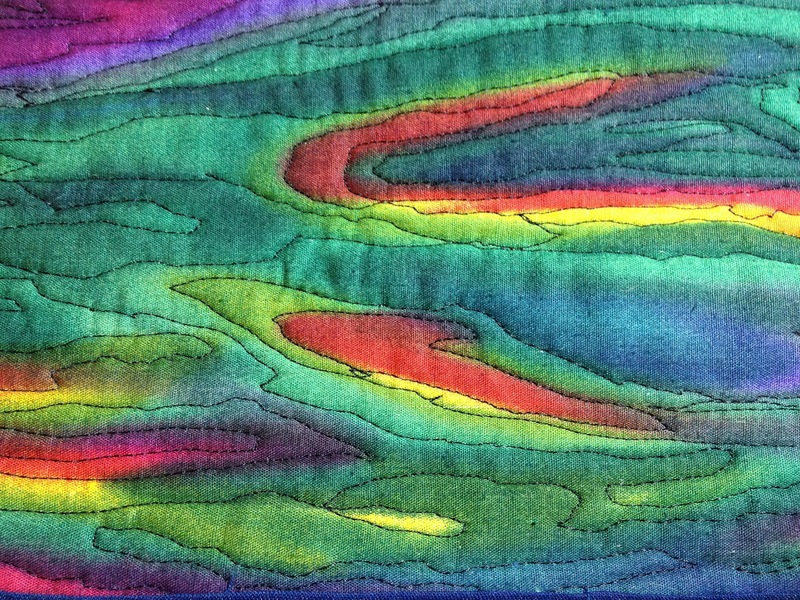 See you tomorrow when I post my inspiration quilt - for Project Quilting Challenge # 3.
in order to complete the challenge BUT the twist is – you have until May 30th, 2013 to submit your challenge! At that point, one of my girls will randomly draw a winner of $75 to use at the Fat Quarter Shop. OR if you want to save 20% off your entire purchase of fabric from the Fat Quarter Shop check out this blog post: http://www.talkintuesdays.blogspot.com/2013/01/talknt-jan-29th-fat-quarter-shop.html to find the special code – good through February 10th. Don't miss out on this opportunity to save on this bundle and join the challenge!